Adin has an extensive collection of Antique Victorian style jewelry, such as a necklace, a bracelet, brooches, engagement rings or other jewellery. Originally the term "Victorian jewellery" was designated for articles of jewellery made in the United Kingdom during the reign of Queen Victoria, but not all of the many varieties produced during her long reign, 1837-1901, are now generally classified as Victorian jewelry. 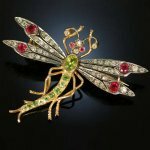 These days in the international antique jewelry trade the pieces now called Victorian jewelry are not necessarily made in the United Kingdom. The term "Victorian Jewelry" became a term used for European jewelry made in the 19th century rather then the description of a certain style-movement in a specific country. The Victorian era began in 1837 when a young Victoria ascended the throne of England. It ended over sixty years later when Queen Victoria died in 1901. During the early years of Victoria's reign, some jewelry was made in Gothic and Renaissance styles. The jewels of the period were often accented with seed pearls and coral. The middle period saw the vogue for ostentatious jewels decorated with the greatly increased supply of pearls and South African diamond. The 19th century saw a revival of interest in archaeological and historical jewelry, influenced by the excavations at Pompeii and the high-quality reproductions made by the Castellanis, Carlo Guiliano, and Gicinto Melillo, and the work of John Brogden. Much Victorian style jewelry was brought back by travellers as souvenirs, especially from India and Japan from c. 1850, and this was imitated in England during the 1860s to the 1880s. Gradually large pieces of antique Victorian style jewellery were supplanted in the 1880-90s by smaller articles, and the production of inexpensive silver jewelry and novelty costume jewelry flourished. Have a look in our catalogue and find some antique Victorian earrings, a necklace, a pendant, a bracelet, diamonds engagement rings, brooches and many other jewels.